ANKARA, Turkey (PAMACC News) – The United Nations Secretary General Ban Ki Moon has called on foreign ministers to prioritize the environment and especially forest management and sustainable land management practices in domestic politics and contribute to the 2030 Agenda for Sustainable Development adopted by world leaders last month as a way of ensuring an integrated and transformative vision for a better world. He said the 2030 agenda, geared at ending poverty and making essential connections between building peace, advancing development and securing a healthy planet should leave no one indifferent. "The 2030 Agenda for Sustainable Development is a universal integrated and transformative vision for a better world. It is geared to end poverty, making the essential connections between building peace, advancing development and securing a healthy planet. The land mark measure includes a target of achieving land degradation,’’ the message read by Gyan Chandra Acharya, UN under-secretary general and high representative of the least developed countries, pointed out. 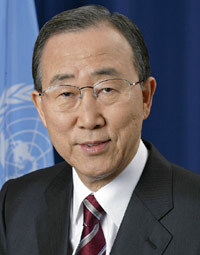 "We must send the right policy signals, thinking globally but finding local solutions" Ban Ki Moon said, adding that just like there is an intrinsic connection between hunger and unproductive land, there is also a link between degraded, decertified land and ongoing conflicts and political instability. Without adaptation strategies and resilience-building to responsibly manage and restore natural resources, land degradation, desertification and drought will continue to trigger force migration and aggravate conflict over limited natural resources. "Smart public financing can encourage local and international private investments in reforestation programmes," the UN chief said, urging investors and companies to join forces with the public sector. Ban Ki Moon called on ministers to encourage investments in land management practices to combat unemployment, raise productivity and boost the income of the rural poor. The High Level Panel meeting of the United Nations Convention to Combat Desertification in Ankara, Turkey was opened today 20th October 2015 by the President of Turkey Recep Tayyip Erdogan. Ban Ki Moon called for investors to work hand in glove with governments to achieve the desirable results as the world looks ahead to the momentous climate change conference in Paris. “As we look ahead to the decisive climate change conference in Paris, let us carry the call for land degradation neutrality as a powerful tool for adaptation. This will largely strengthen resilience to climate impacts, with focus on the poorest and most vulnerable communities. The governments cannot do this alone. They need to be accompanied by investors in the private sectors. These investors have the power - and I believe the responsibility - to do their part in transforming the global economy is now,’’ Ban Ki Moon said. UNCCD executive secretary Monique Barbut, noted that the sustainable development goals carry along specific protection of the environment and restoration of the ecosystem which require all signatory countries to commit to land degradation neutrality by 2030. ‘’We are particularly encouraged to note that the Sustainable Development Goals include specific goal on the protection, restoration and promotion of a sustainable use of terrestrial ecosystems, which requires us to become land degradation neutral by 2030 [target 15.3],’’ Barbut said. Turkish President announced a series of reforestation projects in the nearest future to strengthen the ongoing land restoration programmes in the country. ‘’Rehabilitation of forest has intensified in our country since 2012 with over 3 million trees added to our land and we envisage to cover over 4/5 of the land with trees by 2040. We are looking forward to construction a green airport designed in eco-friendly manner,’’ he announced. A memorial forest for all participants at the COP12, 2015 conference on desertification will equally be created. The President of the Republic also announced Turkey’s readiness to assist other desert prone countries especially in Africa combat the climate monster. The various speakers at the High level opening session expressed the need to see important decision reached at the minister’s session this week. “The minister’s session is the most critical stage. Decisions taken at this point are usually binding and they come with timelines,” says Hele Pierre Cameroon’s minister of environment, nature protection and sustainable development shortly after the opening of the high level session. 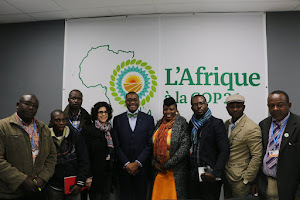 African negotiators during such high level sessions say they were looking forward to a win –win negotiation process. ‘’The negotiation process is all about compromise. In negotiations, there are no winners. It is all about compromise and it is all about give and take. And if the ministers of countries are not there to compromise, then the other part takes it all in their absence,’’ says Payang David UNCCD focal point in Cameroon.